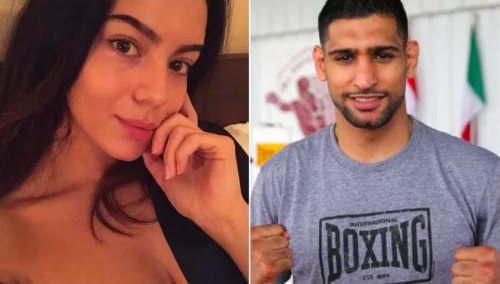 A 22-year-old beautician has claimed she slept with Amir Khan, just 17 days after the British boxer welcomed his second child with wife Faryal Makhdoom. Reports The Sun, Sophia Hammani said that she met Khan in East London, where they ‘flirted’ with each other. The two later took their romance to a shisha lounge and then to his hotel room, all while presuming he was divorced, she claims. Hammani also claimed that Khan left her just £20 to take a cab back home..
Khan, however, took to his official Twitter handle to rubbish the reports as he revealed what exactly had happened when he bumped into an ‘inebriated’ Hammani. “What total nonsense! She was wanting a pic but was told to leave by security due to her being too drunk,” the former two-time world champion wrote. This is not the first time Khan’s personal life has been a topic of public discussion. In September last year, the 2004 Olympic silver medallist parted ways with Makhdoom after a public spat on social media. The couple, however, reconciled soon and welcomed their second child, a baby girl named Alayna, last month.